It includes lodging at a 2 person bungalow in Inotawa and 1 night camping at station Tambopata National Reserve, includes bilingual local guide, all transportations, complete 3 meals per day, DIY cafeteria station 24/7, camping equipment and pick up and drop off to and from the airport. Camping equipment provided by Inotawa includes tent, mattress, sleeping bag, telescope, portable bathroom and dining room. Exposition of our conservation projects. Arrival in Puerto Maldonado. Upon arrival at Padre Aldamiz Puerto Maldonado airport you will be greeted by one of our Inotawas guides, who will take you to our headquarters in the city. In our office you will register and will be able to review the list of recommended luggage and have the opportunity to buy some of the things you may require as batteries, raincoats, medicines, etc. However, we recommend you to have this list ready in advance and have everything organized for your trip before hand. If you have time to spare, we will take you to the city free tour . After 2 hours trip by land and river, where we will have our lunch, you will arrive to the Area of Private Conservation of Inotawa, Here you will be taken to your coupled separated bungalows made of bamboo, and have a night walk to see the nightlife around the area, for afterwards enjoying an exquisite dinner in our dining area. Going to bed early, for tomorrows activities. of macaws, parrots, parakeets and some other mammals such as deer, capibaras, squirrels, etc. The place is a cache of observation just 30 meters from the collpa, excellent watchout point. 10:00 am – Expedition collpa Chuncho and camping. Collpa Chuncho lies within the Tambopata National Reserve, 4 hours from Inotawa, sailing through the Tambopata River. During the crossing, where the river disperses in arms and channels that forms many islands with secondary forests and wide beaches of gravel, we can observe riparian wildlife ranging from birds such as herons and kingfishers, to large mammals from the Amazon such as the capybara and the jaguar. We will stop at the checkpoint La Torre to check in . 1:00 pm – Lunch at the falls El Gato. Lunch at a local diner, run by the Ramirez family, which has a spectacular view of the gorge El Gato and its waterfall. 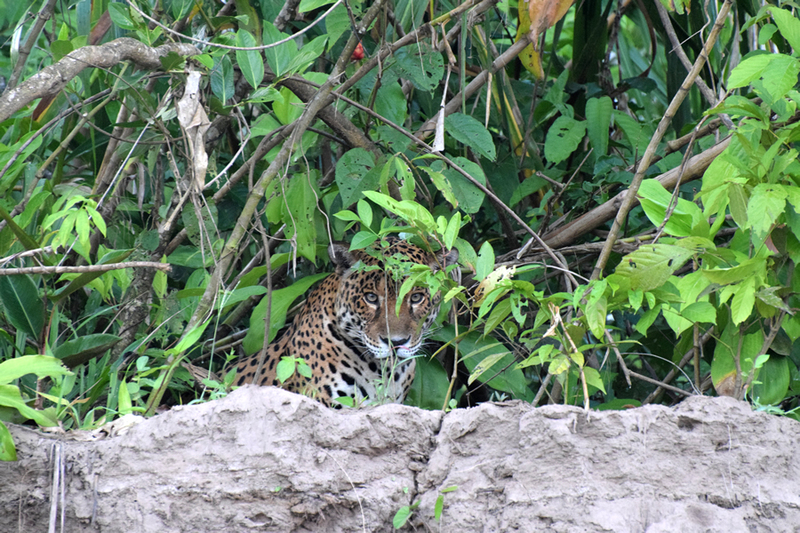 3:00 pm – Post Malinovsky control the Tambopata National Reserve and camp. After checking in with the rangers, we will start a walk around while the camp is prepared. During this we will track footprints of mammals such as peccaries, tapirs and picuros on their path to the collpas, as well as predators such as the jaguar, hovering around the site. We camped that night under the stars of the reserve Malinowski at a safe distance from the guides and park rangers. 4:30 am – Sighting in collpa Chuncho. At dawn we will go by boat for 25 minutes and a 10 minute walk to reach the hiding place to observe the bird activity. 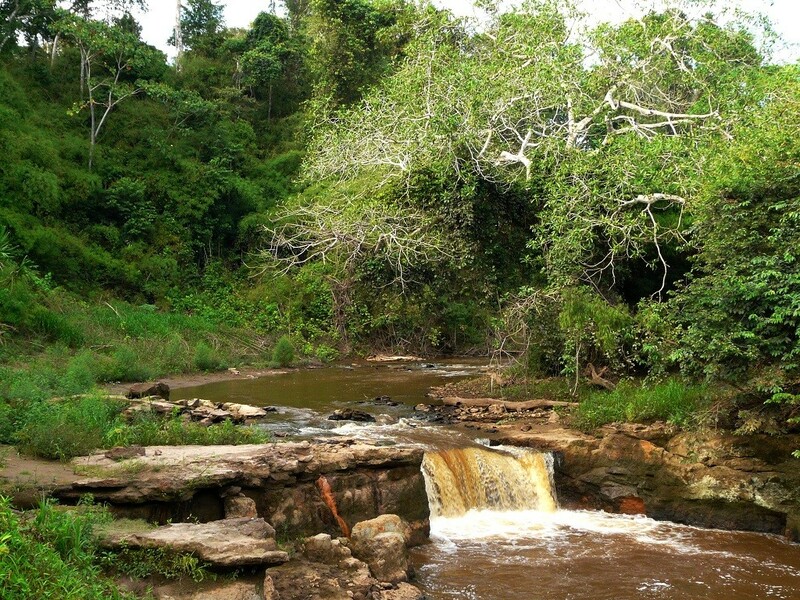 The Chuncho collpa is a ravine about 10 meters high on the edge of an arm of Tambopata, which attract several psittacine species (macaws, parakeets , and parrots). The most representative in this collpa is red and green macaw, the largest species in Peru. These birds come every morning to be provided clay gully before feeding of berries, activity lasting between 1 and 3 hours. First come the smaller species, such as parrots and parakeets, macaws and finally, the others, an exceptional show of sound and color. 8:00 am – Breakfast at the hideout (box lunch 2 sandwich, 1 fruit, 1 pancake, granola, ½ liter of water). 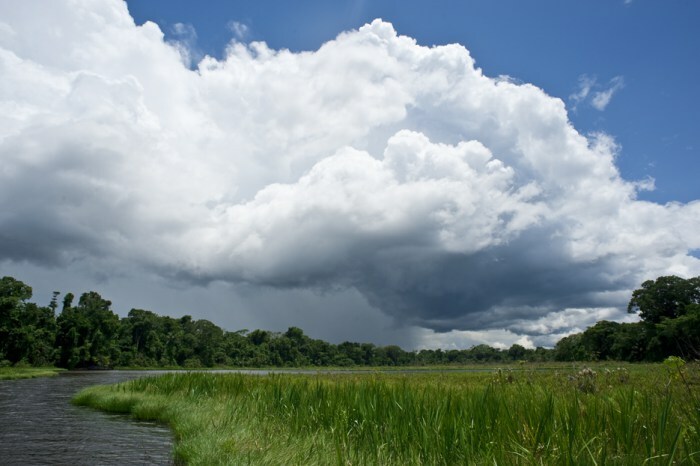 3:30 pm – Lake oxbow( 3 chimbadas) and piranha fishing. We travel for 15 minutes by boat and a 40 min walk along the path that crosses the ecotouristic concession of Infierno, reaching a water mirror characteristic of the Peruvian Amazon: Oxbow lake or Tres Chimbadas. To enter the lake we will pass the checkpoint in the community Hell ( infierno), they guard and give maintenance to the area using the revenue generated by ecotourism. We will float at Oxbow lake in a catamaran, traditional boat paddle to move around. Following the path indicated by the guide, we will see wildlife and lacustrine vegetation birds like Shansho, Needle duck, heron, Kingfisher; some reptiles and mammals, especially so sought Otters, because, where a family lives several copies often be seen. Please review this link with a list of species that live in Tambopata. 6:30 pm – night boat ride and bird fauna. 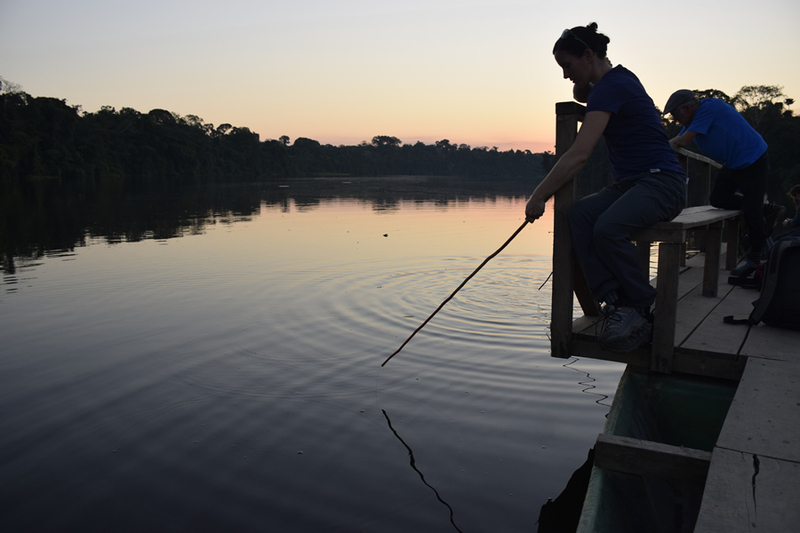 At dusk we leave by boat up the Tambopata River to enjoy the sounds of the jungle invading the night. In addition, we can see the constellations of the South, as Scorpio, Sagittarius, the Southern Cross, etc. We will take a reflector into the boat, to enlighten the animals on the river shores, it is common to find caimans, capybaras or chotacabras on the banks and meandering river. Thanks to your visit, Inotawa can develop some conservation projects. Amongst them, monitoring wildlife with camera traps, which can directly observe the state of our protected areas, since the sighting of large mammals serves as an indicator of a healthy ecosystem. We will show you the images captured by the cameras and identify the animals, learning about their behaviors. In addition, we will show you some of the other projects, their scope and importance, and the ways in which we can contribute to them. Breakfast and return. After an early breakfast, we return to the office in Puerto Maldonado Inotawa and then to the airport, where our guide will advise us and help as required for our flight back to Lima or Cusco. COST INCLUDES: BILINGUAL GUIDE, ALL TRANSPORTATIONS, ATTRACTIONS ENTRANCES, 2 BUNGALOW UPGRADES, ALL 3 MEALS ALL DAYS (EVERYTHING EXCEPT BAR), FROM AND TO THE AIRPORT. Remember that put an extra or add ons available, in your pack after coordination with reserves.